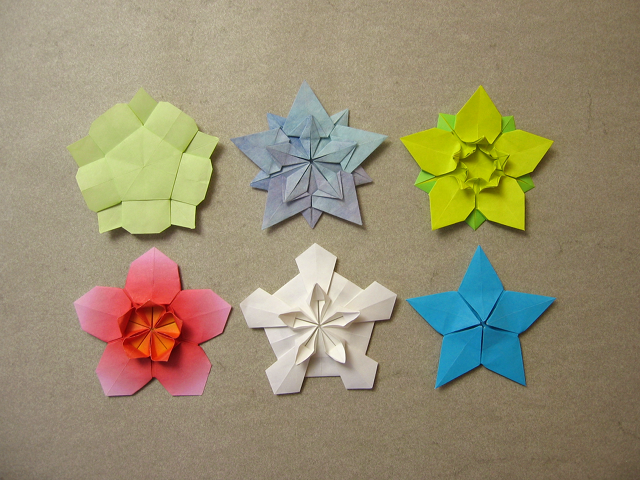 Here are a couple of different shapings of the Sakura Star. I love how diverse it is. The model in the top left corner shows the "reverse" of the model, all others the "front". Any chance of a tutorial? Yes, it's already recorded and close to the final edited version. This is scheduled to be uploaded on the first weekend of April (probably 5th). Hooray! Yes, that is good news, and I will be looking forward to it. Thank you, Sara! Hello, can I use Elmers muti purpose spray adhesive for making tissue foil paper? because it says it can be used with paper, foil or etc. or can I use other spray adhesive? than wallpaper glue? thank you. Yes, that should be ok. Some spray adhesive can lead to quite thick tissue foil, though - depends on the brand a bit. When spraying, do go outside or to a well ventilated area, and don't overdo it. A thin layer is absolutely sufficient. In the end, the best way to find out whether a glue suits your purposes is to give it a try. How do you fold the fifth model (white)? It looks interesting.